The Dracaena Compacta is a striking plant, distinguished by its tightly compacted leaves surrounding its green stem. Its leaves are approximately 5 to 10cm in length, and thin to the touch. Dracaena Compacta are used as indoor plants as they are slow growing and slow to change their height and shape. We love using these plants in our indoor vertical gardens because of their lush, textured nature that add form and greenery to the living walls. These plants require a lot of specific care, and respond with difficulty to trauma. 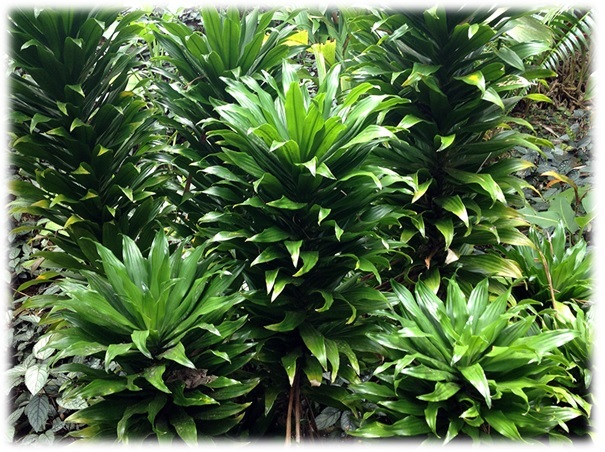 A good understanding of Dracaena Compacta will enhance the growth of this beautiful plant. The Dracaena Compacta can tolerate moderate light when indoors. Low light tends to stagnate growth in this plant, and the foliage at the base of the plant will begin to loosen and die. A common problem experienced in the care of Dracaena Compacta is the browning of the tips of the leaves, but sufficient light and reduced water will assist in preventing this. The Dracaena Compacta can tolerate high levels of indoor light, however the plant will use water at a more regular rate as a result and frequent watering will therefore be needed. Ensure the plant is balanced and that the light is evenly distributed around the plant. The Dracaena Compacta is a fussy drinker, and is often described as being on the dryer end of the watering spectrum. When in moderate light conditions, the plant can be watered every second week. When watering, do so until the point where the water starts to trickle into the drip tray and then stop. The general rule of thumb is the more light the plant receives, the greater the frequency the plant should be watered, and the lower the light, the less the plant should be watered. This beautiful plant tends to enjoy soil that is more clay based, however it does tolerate loam soil from which it can draw its nutrients. The Dracaena Compacta requires very little fertilizer due to the fact that is it very slow growing and is not active enough to process nutrients sufficiently from the soil. Generally speaking, adding nutrients or fertilizer may case leaf spots of chemical burn. The yellowing of leaves due to under-watering. This can be rectified by increasing the frequency of watering slightly. The tips of the leaves become brown and “crunchy” due to over- or under-watering. To resolve this, the tips of the leaves can be cut back to the green part of the leaf, or removing the entire leaf if the problem is severe. The most common pest found on the Dracaena Compacta is the Mealy Bug, which are small white bugs which enjoy living in the crown of the foliage. Mealy bug is best treated by wiping the visible bugs off with a wet paper towel or wet wipe. If the problem is severe, the crown can be cut out altogether. This striking houseplant requires attentive care, but brings about a stark contrast to any space. Keep your plant looking green and healthy by gently dusting it on a regular basis using a duster. We would love to see your very own plants growing well – send us a photo of your Dracaena Compacta and share your Green Fingers tips with us by emailing admin@livinggreenwalls.co.za.